A Better Complexion Before You Know It! If you currently have acne, acne scars or scars from trauma to the skin, Dr. Michael W. Gray and Skin Deep Spa offer the latest in acne and scar treatments. These state-of-the-art skin care procedures can give you clear, acne-free skin and improve your complexion with only a few treatments. The first step in preventing acne scars is the treatment of acne. The key to preventing acne scars is preventing acne. Acne is an infection that starts deep in the pores of the skin where the oil glands are located. If the pore gets blocked and infection can occur. The key to treating acne is the prevention of the obstruction of the pores. Skin Deep Spa offers a variety of acne and acne scar treatment procedures such as C02, Pearl, CO2 repair, Micro Laser Peel, Fraxel, Halo, Laser Genesis, Subcision and fillers and many others. All of your options will be discussed in detail during your complimentary consultation with Dr. Gray. This procedure is a pain-free, non¬invasive treatment for moderate, active inflammatory acne in all age groups. Omnilux-Blue uses Photo Dynamic Therapy (PDT) technology to target acne-causing bacteria without affecting surrounding tissues. This blue light effectively kills bacteria and clears the skin. This procedure is a crystal-less approach to microdermabrasion that is gentler on the skin than the traditional method. It uses diamond chips combined with the cleaning action of a vacuum to promote better-looking skin. The Rejuvapen is a fractional micro-needling device with a unique spring-loaded disposable needle tip that uses an automated, vibrating stamp-like motion that enhances results while offering a more controlled and safer method of treatment than other micro-needling devices, all while causing less epidermal damage. The automated needling motion minimizes pain and discomfort, while increasing the effectiveness of treatments by promoting an even absorption of topicals into the skin. It is as effective as Fractional Laser Therapy and IPL, but has a significantly shorter recovery period. Rejuvapen offers exceptional results, is easy to use and has better precision and control than leading alternatives, all at a fraction of the cost. The method of action is to weaken the bonds of how a scar has previously healed allow the body to re-do the scar when surgical excision is not desired nor indicated. Rejuvapen is great for many types of scars including acne scars, web scars and even thickened hypertrophic scar. New fibrin and collagen is formed as you heal, resulting helping the body heal better. Excellent for skin rejuvenation. Medical Skin Peels provide a quick, painless way to get the glowing skin you’ve always wanted. Celebrities use these in-office strength peels to keep their skin looking great year after year. 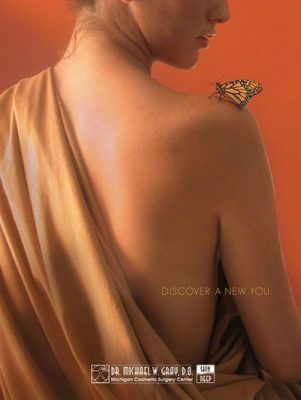 A series of Medical peels will be recommended for your specific needs by the staff at Skin Deep Spa. These include Glycolic, TCA and Phenol peels and others. This procedure involves releasing the underside of the pockmark scar which smooths the surface of the skin. Further results can be achieved with Bellafill ( Artefill ) if needed. Bellafill ( Artefill ) restores the volume which was lost due to the acne infection. Ice pick scars are best treated by the excision of the ice pick scar. This often leaves the area less indented. This is achieved with Hole Punch Excisions and converts on type of scar to one that is less deep. When on the face CO2 laser is recommended with Hole Punch Excisions. Laser is designed to treat imperfections of the skin. Whether you are experiencing scars, wrinkles, loose skin, imperfections in texture, color or tone, Lasers use amplified light to treat many of the problems we experience with skin as we age. The heat that is generated from a laser can smooth wrinkles and tighten the skin. CO2 is the strongest of all lasers and is limited to use on the face. Lasers directed at the skin soften the appearance of deep lines and wrinkles to completely eliminate fine lines, and drastically improve the appearance of scars. CO2 is the best laser for facial skin and CO2 repair is the best laser for use on the body. This product uses ingredients that have been compounded together to rejuvenate and aid your body in healing skin. TheraSCAR works best when applied to the skin at the time of the injury and is considered a basic component of any first aid to the skin. 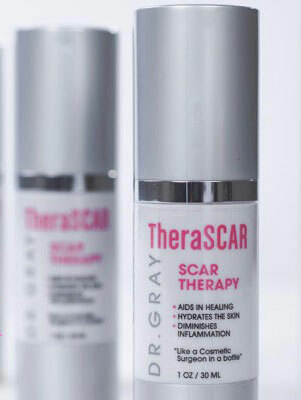 TheraSCAR helps reduce the appearance of scars and, as a result, can give you back your confidence in how good you look. Sealing a wound maintains hydration and creates a barrier to infection. Anti-inflammatory agents counteract the negative factors that may work against healing by possibly decreasing fibrin (scar) and increasing cellular In-growth (skin).